Kentucky friends - On May 17, Anthony Zipple Sc.D., MBA. and I will be presenting a workshop entitled, "Engaging Staff in Turbulent Times." Tickets are only $10 and available at the link below. Join us for an engaging and interactive morning! Rapid change, uncertainty, and fluidity are the defining characteristics of our world today. While this kind of turbulence presents great opportunities, it can be stressful for us and our staff. Keeping our staff engaged and focused on doing great work in this kind of environment can be challenging. This workshop will discuss the importance of staff engagement and provide practical tools for improving staff commitment and organizational optimism. 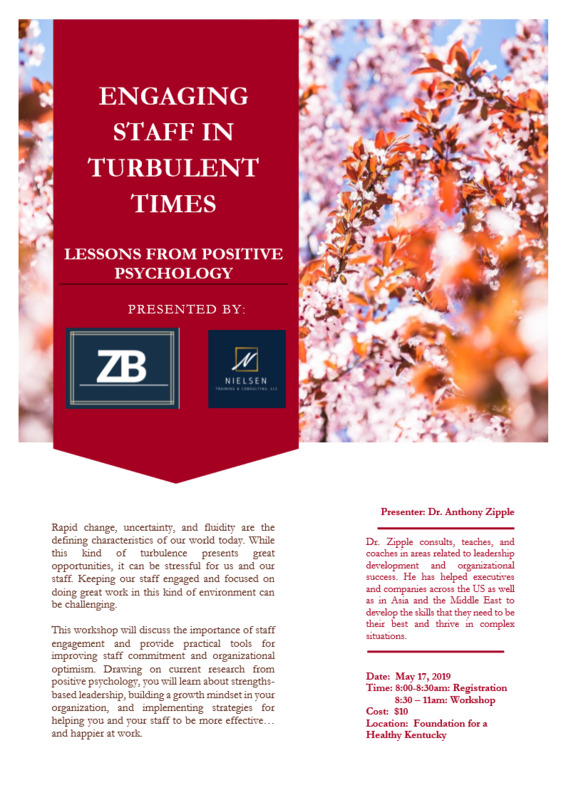 Drawing on current research from positive psychology, you will learn about strengths-based leadership, building a growth mindset in your organization, and implementing strategies for helping you and your staff to be more effective… and happier at work. A tremendous group of #nonprofit #leaders gathered this morning for an engaging and informative #socialmedia workshop. I was pleased to facilitate this workshop in partnership with Energized Solutions, LLC, Emerald Meeting & Event Planning, and Planet Einstein.